I've added this link to the photo area of my site. Click here to see what I have up so far. My dad's big day at the airport. 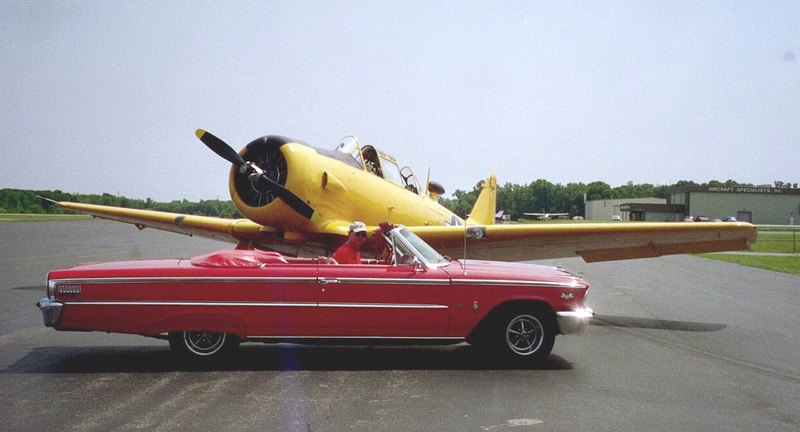 Dad's bright red '63 Ford Galaxie 500 sitting in front of the bright yellow T-6 WWII "Texan" Combat Trainer that he got to fly in a couple weeks ago. Let's just say that he was on cloud 9 that day, and that's not just a figure of speech on this occasion. The plane ride, provided by Warbird Sky Ventures, is available for flights at various locations in the US. Check out their website for more information. With prices ranging from $189.95 all the way up to $549.95, it is an experience you won't soon forget.